LEYTE'S PRIDE! Wrestling Team of #LeyteEVRAA2018 hauls 13 gold and 2 silver. Coaches: Ma’am Baby Salvacion Canamaque and Sir Jose Edgar Blones. 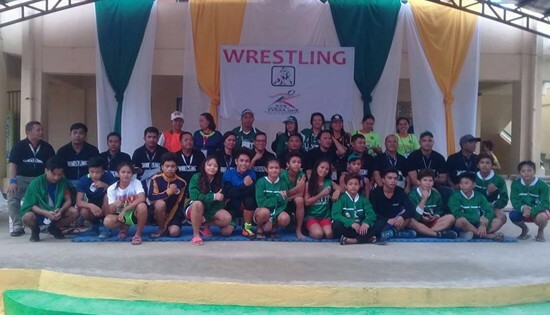 CALBAYOG CITY – Leyte Conquerors lived up to their stellar billing dominating the Wrestling Competitions with 13 gold medals of the 16 gold at stake and two silver medal in the Eastern Visayas Regional Athletic Association (EVRAA) Meet 2018 at the Rawis Covered Court, Feb. 6. The win was four gold medals greater than the nine gold they have in last year’s EVRAA to claim the championship in the event. “The team will continue training for the Palaro as we want to surpass the six gold medals we got in Antique last year,” said Jose Edgar Blones, coach of secondary girls. Coached by Baby Salvacion Cañamaque, the secondary boys bagged 7 gold and 1 silver and the secondary girls capped six gold and 1 silver. Gold medalists in the boys category were Joenil Lagarde, Crispin Cruzzel Caliguid, Diomel Hugo, Jesus Gabriel Raganit, Jonathan Berdida, Pedro Obias and Anthony Pangan. “We are going to Vigan and hopefully we win gold also,” said Lagarde. In the girls division, the gold medalists were Zenith Gayas, Lovely Ann De la Cruz, Jane Erasmo, Veronica Ompod, Mariel Liwanag and Renalyn Claros. The silver medalists were Joel Belecario and Marilyn Villaruel. 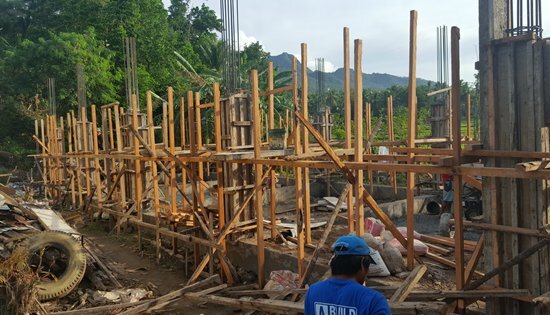 On-going construction of 1 storey, 2 classroom (toilet attached) at Balaquid Elementary School, Cabucgayan, Biliran. The project has a construction cost of P2.834.09M under contract with BNL Construction. As of January 31, 2018, it has an accomplishment of 10%. NAVAL, Biliran – The Department of Public Works and Highways (DPWH) Biliran District Engineering Office implements 76 school building projects worth P367.6M funded under FY 2017 DepEd - Basic Educational Facilities Fund (BEFF) that is just released on the later part of FY 2017. Engr. Salvador G. Regis, Chief of the Construction Section says that out of 76 projects, three of these have already started while 73 are Not-Yet-Started (NYS) because of the suspension of work activity due to the damaged caused by typhoon Urduja and other matters such as the perfection of contract. Regis informs that that the on-going projects are the P2.8M Construction of 1 storey, 2 classroom (toilet attached) at Talibong Elementary School, Cabucgayan, Biliran; P2.8M Construction of 1 storey, 2 classroom (toilet attached) at Balaquid Elementary School, Cabucgayan, Biliran; and P4M Construction of 1 storey 3 classroom at Maurang Elementary School, Caibiran, Biliran, all under the supervision of Engr. Alberto V. Cañete, Project Engineer. Engr. Cañete reveals that the said projects were started on December 5, 2017, however due to the onslaught of tropical storm Urduja on December 15-16, 2017, these projects were suspended. “Work activity for these three projects were temporarily suspended after Urduja due to the difficulty in transporting the materials to the site. Construction will resume on February,” says Cañete. Based on Biliran DEO’s physical status report, these three on-going projects have an overall actual physical accomplishment of 0.39%, hence still meets the target of only 0.19% as of January 31, 2017. CALBAYOG CITY – Experienced players Jaymel Callera and Deanna Marie Labtic spearheaded Leyte’s campaign in Billiard’s 8-Balls competition at the Christ the King College on Monday. The 17-year old Callera, who is a veteran in Billiards tournaments in the region, blanked James Howard Bertumen of Eastern Samar in his first match in the race-to-three elimination round in Bracket A.
Callera of Sta. Mesa NHS then outlasted Jade Las Piñas of Maasin City, 3-2 to advance into the quarterfinal round against the winner of the match between Jayvee Cayson of Tacloban City and Caesar Ian Valles of Catbalogan City. “I want to have the gold medal for the cash incentive,” exclaimed Callera in the interview along with his coach Melvin Calupaz of Cabacungan NHS. In Bracket B, Rommel Damiles bested Francis Copada of Tacloban City after taking a bye in the first round. Damiles, who came from Puerto Bello NHS, will next face Mark Neil Rey Salas of Biliran. In the distaff side, Palaro veteran Labtic, who came from San Isidro NHS, defeated Jonalyn Surio of Northern Samar to arrange a duel with Angel Yanga of Samar in the quarterfinals. Labtic’s teammate Beatemae Kate Ibarra also advance to the next round with a win over Christine Yero of Southern Leyte. PARIS – At 12:30pm yesterday, supermodel Jessica Minh Anh officially added Hong Kong into her famous catwalk series at the world’s most iconic venues. Featuring the city’s picturesque skyline, J Winter Fashion Show 2018 premiered 6 haute couture and pret-a-couture collections from Europe, Asia, South America, and America on the sky-high sundeck of Costa neoRomantica cruise ship. More than perfectly marrying fashion with the old and new Hong Kong, Jessica successfully celebrated the rise of a new generation of female creators. QUEZON CITY – The House of Representatives, voting 212-55, approved House Bill No. 6834 on its third and final reading yesterday, February 6, 2018. The said bill is set to replace the Batas Pambansa (BP) 880 or the Public Assembly Act of 1985. Under HB 6834, in lieu of securing a permit, rally organizers would need to serve a notice to the mayor, three working days before the protest. The bill will impose graver penalties of 6 months to 6 years imprisonment for rallies without notice, or those held outside the notice’s coverage. “A permit or a notice should is not a prerequisite for the Filipino people to exercise their right to peaceably assemble. That is a basic right enshrined in the Philippine Constitution and international human rights instruments. It should take precedence over insidious attempts by a Duterte-controlled Congress to pass another repressive legislation that will further curtail people’s rights,” said Palabay. “The use of BP 880 to file trumped-up charges against leaders have been tirelessly used by the police as basis for illegal arrests. No doubt that HB 6834 will be used to the same end,” Palabay noted. The Karapatan secretary-general cited the cases filed against Karapatan’s own paralegal staff, Neil Legaspi, Bayan secretary general Renato Reyes and spokesperson Teddy Casino, and several other leaders of progressive groups who took to the streets on November 2017 during the visit of US President Donald Trump in the country. “The Duterte regime has caused and enabled systemic injustices that merits the people’s indignation and protest. Yet here it is, working ways to further cripple measures for individuals and organizations to demand accountability,” she added. “HB 6834 was passed yesterday, along with the Supreme Court’s decision affirming the constitutionality of martial law extension in Mindanao. Duterte is relentless in bombarding us with repressive policies, expecting other draconian measures to pass discreetly. We thus call for vigilance. If all this is indicative of something, it is that the Duterte administration holds the legislative and the judiciary by its neck, and is completing the recipe for a full-blown dictatorship,” concluded Palabay. 8ID chief MGen. 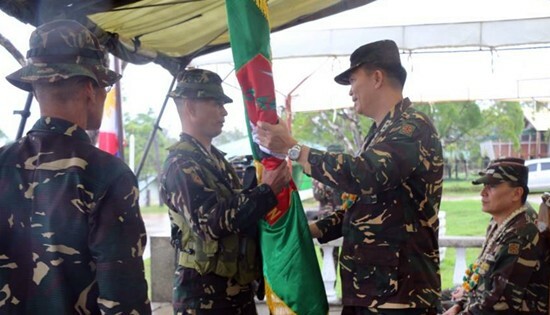 Raul M. Farnacio AFP, hand-over the unit symbol to LtCol. Hilarion G. Palma INF (GSC) PA, during the activation of the 93rd Infantry (Bantay Kapayapaan) Battalion, Philippine Army at 8th Battalion Retraining Facilities (8BRF) at Camp Eugenio Daza, Brgy Fatima, Hinabangan, Samar on February 5, 2018. CAMP LUKBAN, Catbalogan City – The 8th Infantry (Stormtroopers) Division, Philippine Army activated the 93rd Infantry (Bantay Kapayapaan) Battalion with Maj. Gen. Raul M. Farnacio AFP, Commander, 8ID as the keynote speaker at 8th Battalion Retraining Facilities (8BRF), Camp Eugenio Daza, Barangay Fatima, Hinabangan, Samar on February 5, 2018 at 10 o’ clock in the morning. The activation of this unit is purposely to prevent the spill-over of hostilities in the aftermath of Marawi crisis, destroy the CPP-NPA Terrorists (CNTs) the soonest possible time and assist the government agencies in addressing illegal drugs and Private Armed Groups (PAGs). “Bantay Kapayapaan” Battalion is headed by Lt. Col. Hilarion G. Palma composed of brave and proficient Officers and Enlisted Personnel that will augment the Infantry units in Eastern Visayas. “Like any other battalion, I know that you would form your own culture and identity as a unit. I challenge you therefore to go beyond the brand, and instead strive to create the prestige of a unit that is known for its performance excellence, empowerment, commitment and accomplishments,” Farnacio added. QUEZON CITY – With efforts to establish a mandatory SIM card registration gaining steam in Congress, the Foundation for Media Alternatives (FMA) released a briefing paper on the subject this Monday, February 5, 2018. In conclusion, FMA declares that the promise of SIM card registration to help law enforcement and improve the delivery of government services has already been revealed as illusory, or at least significantly inflated. The group then enjoins the government to consider all things – particularly the dangers posed by the proposal – before rushing to pass a policy that can do more harm than good. For the public, they need to remain vigilant and resist any or all measures that attempt to narrow individual space for privacy and other related rights and freedoms. 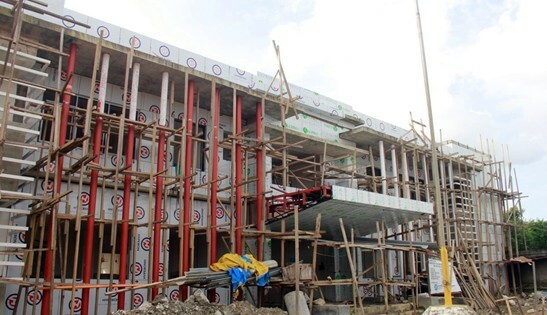 CALBAYOG CITY – DWPH Samar First Engineering District Office fast tracks the ongoing construction of a (2) two storey DPWH Engineering Office Building, located at Brgy. San Policarpo, Calbayog City inside SFDEO compound. This project is implemented by SFDEO and is under contract with ADB Dynamic Builders and Supply JV NORSAM Builders and Construction Supply with a total appropriation of P30 million sourced out from the GAA Fund. It is in accordance with Department Order No. 81, series of 2012 which provides guidelines for a new uniform design that will easily identify DPWH buildings. The plan maximizes the use of the lot area providing ample parking spaces for both employees and visitors as well as meeting the necessary office space requirements. “The new building is in line with the district’s policy to continuously improve the delivery of our services. Through the new design, we are able to achieve complete organization, cleanliness and standardization which will relate to the improved productivity of our employees, thus resulting to a higher quality of work which will greatly benefit our stakeholders,” said Assistant District Engineer Denis Cagomoc. Sec. Mark Villar delivering his message during the instructional meeting held last January 22, 2018 at the DPWH Central Office in Manila. CALBAYOG CITY – On Monday, January 22, 2018, sixteen Regional Directors (RDs) and 183 District Engineers (DEs) from all over the country attended an instructional meeting regarding the FY 2018 and Proposed FY 2019 DPWH Budget conducted at the DPWH Central Office in Manila. Among them was Samar First District Engineer (DE) Alvin Ignacio. The instructional meeting mainly focused on the general and special provisions of the FY 2018 General Appropriations Act (GAA) as well as its modification and augmentation which was discussed thoroughly by DPWH Undersecretary for Planning and PPP Maria Catalina Cabral. Additionally, Usec. 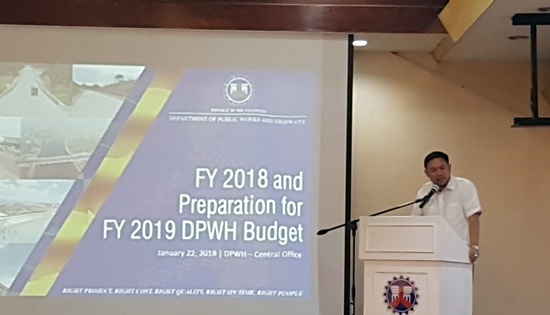 Cabral mentioned that 2018 will serve as a transition period because there will be a shift to annual, cash-based appropriation for the FY 2019 budget compared to the obligation-based approach used in the previous years. Meanwhile, Project Monitoring Division Chief, Melrose Pailma, encouraged those in attendance to religiously update the projects in the Project and Contract Management Application (PCMA) which is a system used as a tool for inspection by reflecting the accomplishment of infra projects real-time in compliance with DPWH’s transparency efforts.